Half of this book review is volunteered by Ahmed, who was kind enough to offer his opinion. 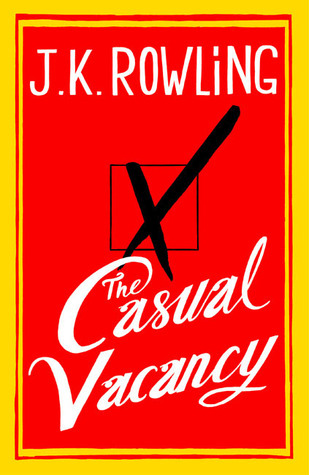 I'll have to admit that I was more than excited to hear that J.K. Rowling's new book was coming out. So excited that I postponed reading 1Q84, which I've been waiting to read since it's been translated. J.K. Rowling's books carried many through their childhood and teenage years, the characters developed and grew up with us. I guess it's only a natural turn of events that her books grew up as well. "All happy families are alike, but each unhappy family is unhappy in its own way"
The book starts with the introduction of each character individually, which is a very classical thing to do. Many considered that to be dull, but as a fan of classical literature this gave me more hope for the book. She carries on drawing a complete picture of the town alongside its inhabitants, their families, their roles in this immaculate small town society unsullied, on the surface, by the grime of big cities. Then, it starts to show how flawed this society is. Among the daily parent/teenager quarrels, one quarrel in particular finds its way into a different realm: the larger parish council quarrels. This unexpected turn of events stimulates a few other to follow, and the book picks up pace, one thing leads to another, and before you know it the book is over! One thing I personally liked very much was the parallel beginning and end. Not to mention, it was a fun light read much less grim than we were lead to believe. Or I could just have a twisted sense of humour. If you were hoping for an Agatha Christie sort of book, you're in the wrong place. This is a J.K. Rowling book, written in her clear precise voice and her wonderful choice of words. Let me begin by saying that I have not read any of the Harry Potter books or watched any of the movies. I generally don’t read much fiction, and the little fiction I read I usually prefer to read in Arabic. But after reading a long profile of Rowling in the New Yorker magazine, I have become curious about her first novel post-the Harry Potter era. I agree with Asmaa that Rowling’s portrayal of life in the town and the traditional build up of events and characters were both nice, although I was a little taken aback by the crescendo in the end which was tragic but probably fitting. But over all I really enjoyed reading the book: the descriptive language, the quirks of the characters, and the interactions and parallels between them were all very enjoyable. Though I have to say that I found the young characters more polished than the older ones. Thanks Asmaa and Ahmed for the reviews. For me, honestly, I've only managed to read few chapters of the book, I reached to the point where I could no longer continue. I agree with you both that Rowling's style is so unique, it is the way she introduces the characters and describes the events, let alone the exquisite choice of words, but the pace of the story, at least in the beginning, is explosively dull. I felt strangulated, I needed a turn in events to breath, the turn never came! Maybe I need to go back and read the book again, at least to be fairer to it in my review. When ... I am not sure!